Thanks to everyone who entered our "Name A Famous Musician Who Uses The Same Instrument So Often That You Think Of That Instrument When You Think Of That Musician" Contest! The entries fell into two categories: 1) Musicians who use one specific guitar, and 2) Musicians who use different versions of the same model. and, of course, John, Paul & George! My favorite answer came from Erin who suggested Leslie Feist and her red Guild Starfire. Leslie likes her Starfire so much that when she dropped it, she immediately came to Pittsburgh Guitars to have the headstock repaired. Every time we see her on TV using the guitar we feel proud! B. B. King and his assorted "Lucilles"
After looking at the list, I noticed that many of these performers eventually signed deals with the manufacturer of their favorite guitar, to create Signature Models. Fender currently offers a Sting PBass, an Eric Clapton Strat, a Stevie Ray Vaughan Strat, and a James Burton Tele. Gibson makes more signature instruments than you could shake a Keith Moon Authorized Signature stick at, including an Angus Young SG and a B.B. King Lucille. Thanks to everyone who entered! Our randomly chosen winner is Justin B. Justin gets a Pittsburgh Guitars $50 Gift Certificate good towards the purchase of any guitar in the store. Hopefully he will use that guitar often enough that it will become his Signature instrument! With regard to amps, most people don't know that Willie Nelson plays through a vintage Baldwin amp... but it's easy to picture the association of Bruce with his 1950s tweed Fender Bassman; Neil Young and his 1950s tweed Fender Deluxe; and perhaps the greatest association ever, The Beatles and Vox amps. Speaking of Vox, a couple of days ago I saw the newly revived B-52's on Jay Leno. They sounded great and looked great! Since it seems that these days almost every band on Leno or Letterman has at least one Vox AC-30 or AC-15, I expected to see a Vox amp somewhere on stage... but it was really fun to see B-52's guitarist, Keith Strickland, playing through THREE Vox amps! PS: Speaking of Signature Guitars, here's John with a vintage Harmony Buck Owens. PPS: Here's John with a new Eastwood Johnny Ramone guitar. 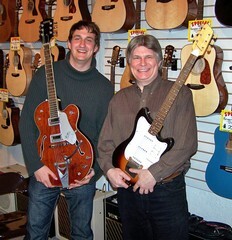 It's fun to welcome out-of-town visitors to Pittsburgh, and to Pittsburgh Guitars. Earlier this week we had a great time talking about the history of the vintage guitar biz with Colin Cripps, the guitarist for Kathleen Edwards. He just purchased a 1966 Rickenbacker 360 OS MG and brought it in to show us. We set it up... and generally enjoyed being in its presence. Speaking of out-of-towners and The Beatles, yesterday we had a visit from Jan Chvatal from Prague, Czechoslovakia. 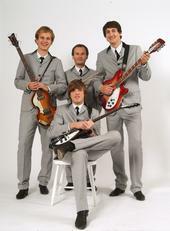 Jan plays in Czechoslovakia's most successful Beatle tribute band, The Brouci Band. He's on a week-long tour of the USA and stopped in to say hello. He was impressed with the Pittsburgh Guitars Beatle Collection, and he mentioned how hard it is to find vintage American guitars in his homeland. He's currently playing a reissue Gretsch Tennessean and he got a kick out of trying my original 1964 model. Now, at this point I know just what you're thinking... When you hear "Czechoslovakia" and "The Beatles," three words come to mind: Resonet Grazioso Futurama. I know! Me, too!! In the late 1950s it was extremely difficult, and expensive, to get American guitars in England. So many young players used affordable European-made instruments. One guitar that turned up regularly in Liverpool was made in Czechoslovakia under the brand name Resonet. The original Resonet model designation was "Grazioso," but the British distributor, Selmer, thought it might be more marketable with a cooler name, and they renamed it the "Futurama." Here's a picture of me (made in the USA) holding a 1959 Resonet Futurama (made in Czechoslovakia) with Jan (made in Czechoslovakia) holding a 1964 Gretsch Tennessean (made in the USA). PS: The Futurama was an affordable European guitar. During the same time frame, an affordable guitar here in the USA was the Silvertone by Danelectro. 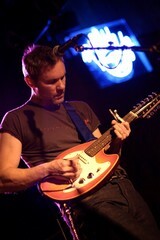 Here is video of John comparing the Futurama to a Danelectro. PPPS: We'd like to put our email special videos on youtube, but every time we try they look fuzzy. Do you know the trick to getting sharp videos on youtube? If so, give us a jingle. So, I finished my taxes on Tuesday... And on Wednesday I decided to take this year's boxes of paperwork to the usual place, the attic. To deal with lower sales figures, Fender cut expenses wherever they could. Unfortunately, this led to them using less than optimal wood, and consequently in 1978, they produced some of the heaviest Strats ever made. Cutbacks also led to some finish issues, and many 1978-79 Fender guitars have cracking and peeling finish problems. Gibson, meanwhile, figured that the way to win new customers was with new models. In 1974 and 1975 they introduced the L6S, The L6S Deluxe, the Marauder, and the S-1...none of which lasted to 1980. One last interesting thing about my old receipts: Like gas, guitars were much cheaper in 1979... but oddly guitar strings weren't.... Or more accurately, guitar strings have not significantly increased in cost in nearly 30 years! When I opened Pittsburgh Guitars we sold a set of Ernie Ball Slinky guitar strings for $3.75. Today we sell that set for $5.00. Only $1.25 price increase in three decades!!! Next month, May 2008, will be our 29th Anniversary... and I'm sure we'll have some fun stuff planned... (Hopefully, there will be cookies!) To get us in a retro frame of mind, this week's email special features Ernie Ball Regular Slinkys at our 1979 price! PS: The Gibson L6S story features one of Gibson's secret models... a guitar that was never in a Gibson catalog or price list: The Midnight Special! (1) In late 1973 Gibson announced a new guitar model. It featured a thin, solid-maple body; a six-position rotary switch for different in and out-of-phase pickup combinations; a tune-o-matic bridge with a stop tailpiece; two new Gibson Bill Lawrence-designed "Super Humbucking" pickups; the option of an ebony or maple fingerboard, and, like every other Gibson, a glued-in neck. It was called the L6S. 181 were sold in late 1973 and 5044 in 1974. It was a hit. At least in `74. (2) Because of the success of the model, Gibson decided to offer, in 1975, a less expensive version. The new version featured the same body and neck, but with standard wiring and a typical toggle pickup selector switch. Other differences were a rosewood fingerboard, instead of the ebony or maple; black plastic pickup covers, instead of chrome; and strings-thru-the-body construction, instead of the stop tailpiece. (3) The new guitar was called the "L6S Deluxe," and the original model was named, retroactively, the "L6S Custom." (4) However, in late 1974, before the introduction of the new L6S Deluxe, Gibson decided to experiment with the original model. They had been developing two bolt-on neck guitars, serious departure from their long history of glued-in necks. The new models were scheduled for 1975 and were called the Marauder and the S-1. The S-1, with it's three single-coil-pickups and bolt-on neck, was clearly designed to steal some of Fender's customers. Getting back to the mystery guitar, in late `74 Gibson took some of the upcoming bolt-on necks and attached them to an L6S body. They used the upcoming L6S Deluxe strings-thru-the-body design, and standard wiring, but the original L6S pickups. They sold these to their dealers as "The Midnight Special." Essentially, it's a cross between an L6S Custom and L6S Deluxe, with a neck from an S-1. If you're confused, imagine what the public was thinking. And the dealers probably never knew what they were getting! The confusion no doubt attributed to Gibson never putting this model in their catalog. BUT, now you know! (5) So, if you see a guitar like the one John is holding here, you might first say, "Well, based on the wiring, I'd call it an L6S Deluxe... But it has chrome covered pickups (like the L6S Custom) and a bolt-on neck (like The S-1)... Why, it must be the elusive L6S Midnight Special!!!" PPS: Here's a picture of John with a 1975 S-1. It was meant to give the Strat a run for its money. But despite early publicity featuring Ronnie Wood from The Rolling Stones playing one, the guitar never took off. It was discontinued in 1979. As I mentioned last week, I was in the attic stashing this year's taxes, when I took a moment to look through other boxes up there. The story starts a year earlier, 1973 to be exact, when I bought my first car, a 1966 Pontiac Catalina Convertible. Man, was it powerful! When you stepped on the gas the entire front of the car lifted up, like a roaring lion. And this was leaded gas... not that wimpy unleaded gas. Plus, the convertible roof was cool, even if it did mess up my hair. Here's the owners card. One day in July 1974, I walked out of my apartment to find an empty parking space where my trusty `66 Catalina had been parked. I was crushed. My first ever car... stolen! 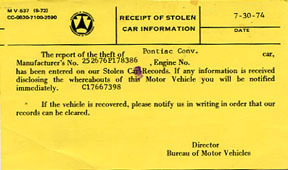 Here's the stolen car filing. It was sad. And, of course, there's nothing sadder than being in Columbus, Ohio, with no car and a new band. Since I was always moving equipment with the Pontiac, I decided that I'd replace the stolen car with a van. I checked the local classified ad paper, the "Tradin' Times," and found something unusual: a used 1966 International US Mail truck! Here's the actual ad. It had a lift-up back door, sliding front doors, and even had the steering wheel on the right-hand side. I drove it for the rest of the summer and used it to move my stuff back home to Pittsburgh in September when the Columbus band broke up (and Annamaria moved to Italy to go to vet school). I got back together with John and Jamie and we formed a new Pittsburgh band. In late September I got a call from Dino Bradley, a guy I met in a music store in Columbus. He wanted the mail truck for his band and offered me a trade: a Strat, a Leslie speaker cabinet, and a Vox Super Beatle Amp for the truck. I said, "Sure." Here's the trade agreement between me and Dino. I was now thrilled to have my first piece of Beatle gear, a big beautiful amp! Here's a picture of the band with the Super Beatle in the back, on the left. Jumping ahead to mid-1976, I was in New York hanging out with Mitch (see "Dita Beard" pictures, above) when we saw an ad that said: "Wanted: Beatle look-a-likes" Mitch had been a Paul McCartney look-a-like his entire life, so we went to the audition and he easily passed. I had been an Ozzie Ozbourne look-a-like my entire life, so I did not try out for Ringo. BUT when the guy running the show said, "Do you know where we can get any Beatle equipment?" 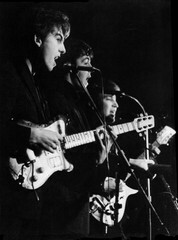 I said, "How about two Super Beatles and a Hofner Bass?" He said, "I'll take `em!" Those early auditions eventually led to a massive Broadway production called "Beatlemania." And they asked me if I could round up as much appropriate equipment as possible. I spent the next two years driving around, buying guitars and amps, and delivering them to the Wintergarden Theater on Broadway. And although I was not a guitarist, I grew to truly love guitars. 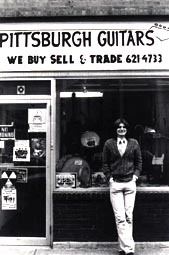 One thing led to another and by 1979: Pittsburgh Guitars! Then, one year led to another, and now it's 2008! And Pittsburgh Guitars is still my second favorite activity! So, you see... as sad as I was that my Pontiac Catalina Convertible was stolen, its theft led to me buy the mail truck... And that led to me trading the truck for a Super Beatle... And even though I didn't play guitar or bass, the Super Beatle led to me buying a Hofner bass... And I sold the amp and the bass to the Beatlemania Show... And that got me started buying and selling guitars... and that led to where we are today... next month's 29th Anniversary of Pittsburgh Guitars. I wonder if we're doing anything today that will lead to something 29 years from now, in 2037? PS: Mitch went on to star in Beatlemania for years. He has performed all over the world. He was in Rolling Stone, Time Magazine and on "Joanie Loves Chachi." He still does Beatle shows today. Here's another shot of Mitch in my basement. He sounded like McCartney, too! 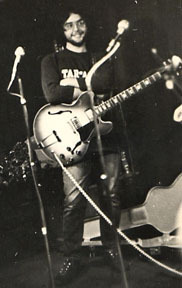 And I always loved that ES-335. PPS: The guitarist in my Columbus band was Mark Chatfield. He now plays lead guitar for Bob Seger. Here he is on David Letterman playing a nice 1950s Les Paul Junior. PPPS: Annamaria eventually became a vet, moved back to America, and is now the Director of the National Pork Producers Council. We obviously went in different directions... me with guitars, her with animals. As much as I like pork, it's best that that relationship didn't work out! 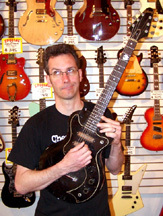 PPPPS: I found out much later that the guy who sold me the $100 Hofner bass was Dave Rusnak, now an old friend of mine! We had known each other for years before we compared "Hofners-I've-owned" stories, and we discovered our connection. It's that old "it's-a-small-world" thing!!! Dave is an avid Beatles fan and has performed at a couple of the Pittsburgh Guitars Big Beatle Shows. PPPPPS: Last week I mentioned the effect (or more accurately, the lack of effect) that disco music had on the public's interest in playing guitar. I said, "Quick test: what kind of guitar did the guy in KC & The Sunshine Band play? I don't know either!" Well, it turns out that one of the readers of the Pittsburgh Guitars Email Special knows!! Dave R. wrote to say that when he was a high schooler in Florida he and his garage band friends would jam and talk about how they'd be famous some day... and one of them actually succeeded! Dave's childhood friend, Rick Finch, was the co-founder of KC & The Sunshine Band. Rick played bass and drums, and co-wrote most of the band's hits with Harry Casey ("KC"). Rick played a Fender Jazz Bass exclusively. 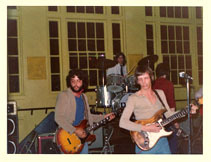 And the Sunshine Band's guitarist, Jerome Smith, played a Fender Telecaster. And now we know!! PPPPPPPS: Customer of the Week: Art All Night! This Saturday/ Sunday!